QUINTESSENTIAL NEW MEXICAN FOOD could succinctly be defined as anything made with New Mexico’s famous red or green chiles. And I’m not talking “a little bit” of chile — “a lot” of chile is what really sets each dish apart from the rest of Southwestern cuisine. Below are eight New Mexican foods that for me, as a long-time resident, are the most addictive, and which I miss most whenever I travel outside of the state. Each could easily be made in any home kitchen and are definitely primed for a broader audience. In addition to the links provided below, you can find recipes to most of these dishes on my site, MJ’s Kitchen. 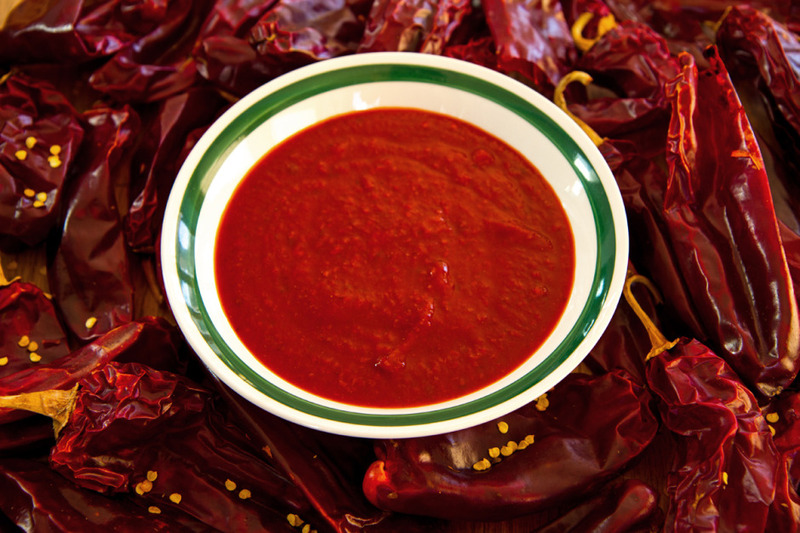 Red chile is a sauce made with dried red chile pods or red chile powder, a liquid (water/stock), onion, garlic, and a little seasoning. It’s used to smother burritos, tostadas, stuffed sopapillas, and eggs. It’s THE enchilada sauce for New Mexico red chile enchiladas, as well as a spicy condiment for a bowl of beans, soup, or stew. It’s a staple product in many New Mexico kitchens. New Mexico’s version of Mexican adobada is made for carnivores. 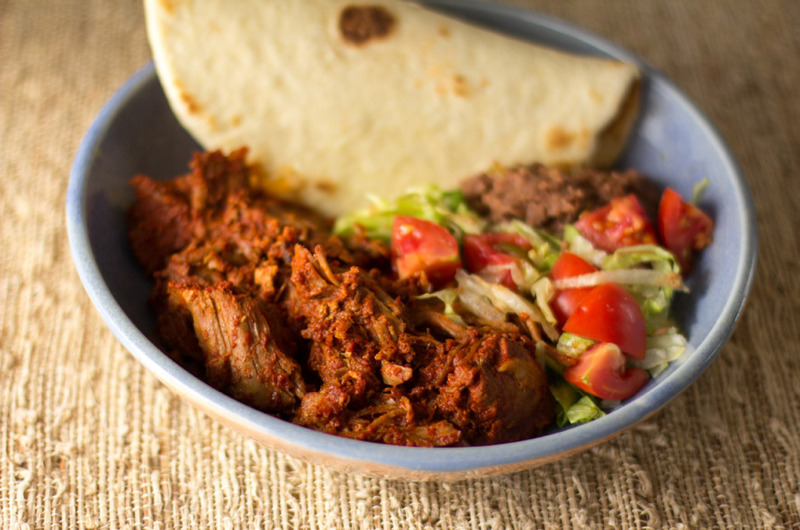 Big chunks of pork are marinated overnight in red chile sauce and then slow-cooked for a few hours. The result is tender bites of spicy, meaty goodness. Carne adovada is usually served with beans and/or rice and a flour tortilla. It’s also used as the filling for enchiladas, stuffed into a sopapilla or burrito, or wrapped in a soft corn tortilla as a taco. The recipe linked below is a quick and modern method for making carne adovada, but it you want to follow the traditional process, you can use any red chile sauce for the overnight marinade and then slow-cook, covered in a 325°F oven, for 2-3 hours. Posole is both an ingredient and a New Mexico stew. Posole the ingredient is corn boiled and soaked in slaked lime water (cal). This process, called nixtamalization, improves the nutritional value of the corn as well as its flavor and size. 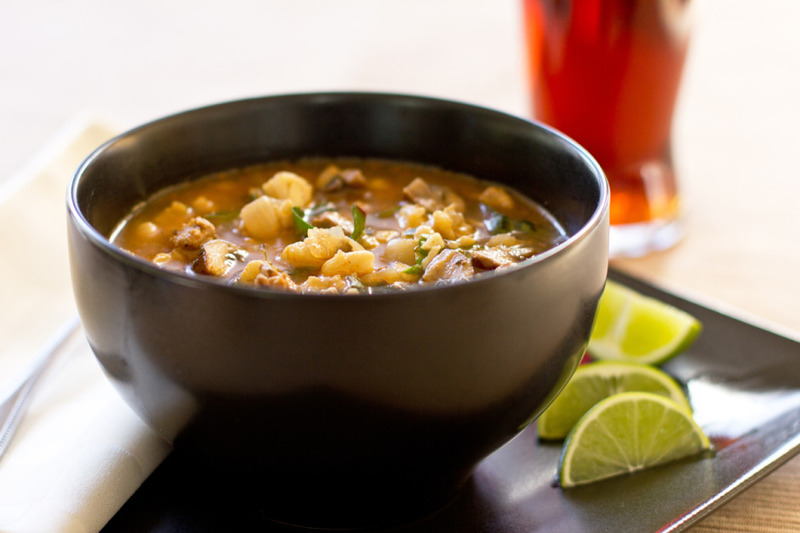 This version of posole is also known as hominy. Posole stew is New Mexico comfort food and, along with green chile stew, a traditional holiday dish. It generally consists of posole, pork, and red or green chile. However, there are many other variations that have been created to fit personal tastes, preferences, and diets. Get creative! New Mexico green chile stew is the quintessential holiday dish. 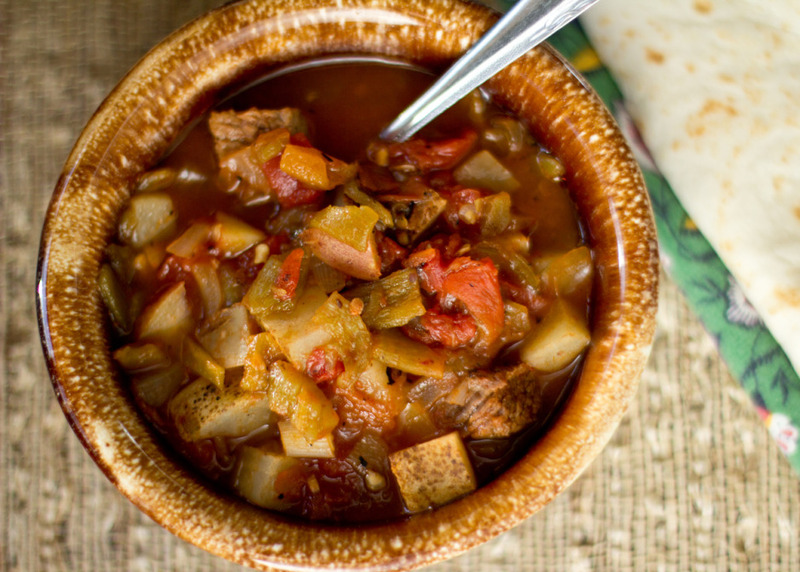 Everywhere you go in New Mexico during the holidays, someone is serving up green chile stew. But honestly, it’s too good to restrict to only one time of year — I start thinking about green chile stew the first time I smell chile roasting in the fall. Traditionally, it’s a soup-like dish packed with roasted green chile, pork, and potatoes. However, just like posole, there are variations. I personally like mine with beef, but I’d never turn down one made with chicken or beans, because truthfully, it’s all about the chile. It’s an easy dish to make and probably the most addictive in all of New Mexican cuisine. 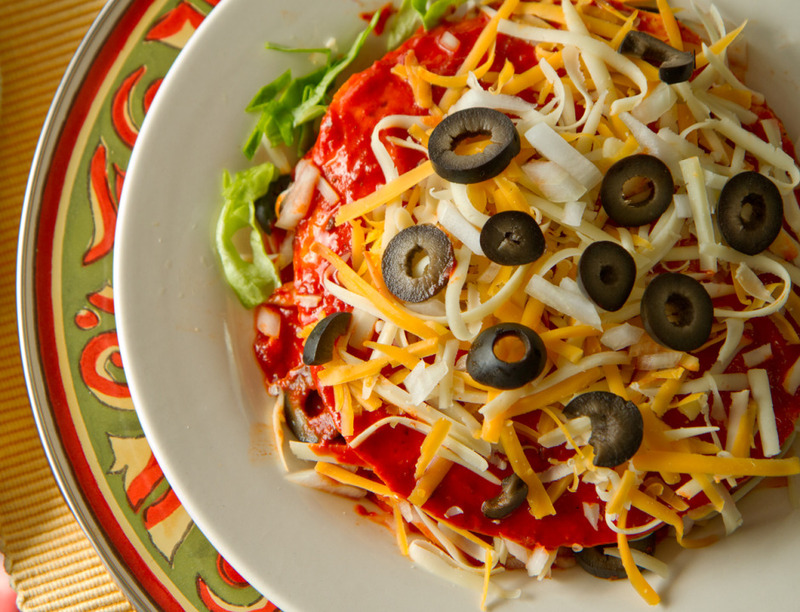 One of our favorite types of enchiladas is the stacked red chile enchilada: three corn tortillas dipped in red chile sauce and alternated with simple ingredients like onion, cheese, black olives, and more chile. The green version uses green chile sauce, cooked chicken, cheese, sour cream, and again, more chile. You can make individual or restaurant-style servings, or a casserole for the family. While the casserole enchiladas are baked in the oven for about 30 minutes, the restaurant-style enchiladas are heated in the microwave or under the broiler for only a couple of minutes. For the final touch, top each serving with a fried egg. It’s hard to find better enchiladas anywhere. Calabacitas (Spanish for squash) is a traditional late summer / early fall New Mexican dish. 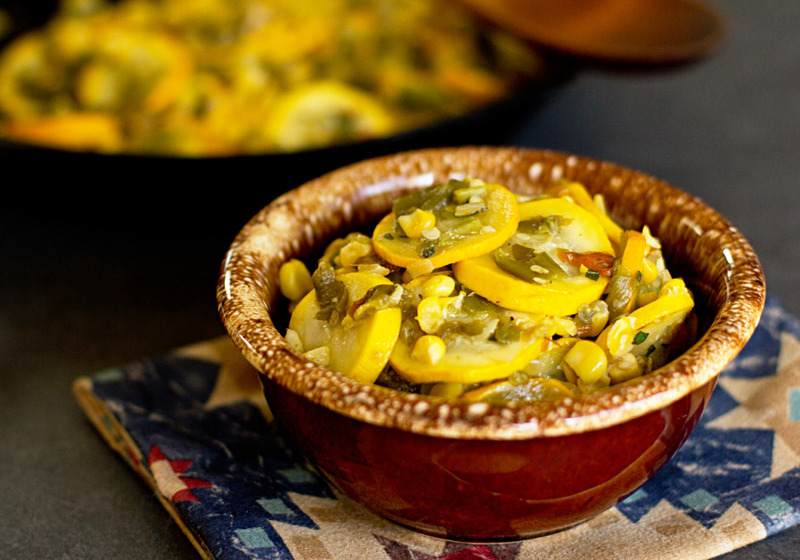 It’s mostly seasonal because it’s best when made with fresh ingredients: roasted green chile, summer squash, and corn. It’s one of those quick sautéed vegetable dishes that goes with just about anything and that really celebrates the flavors of its ingredients. New Mexico calabacitas should be in every cook’s recipe box. 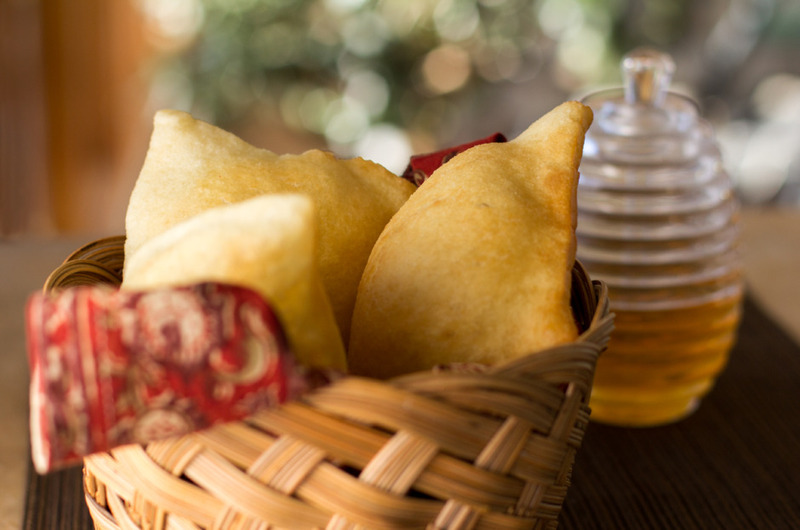 Sopapillas are cut squares or triangles of dough, deep-fried until they puff up into hollow little pillows. In New Mexico, they’re stuffed with just about anything you want to stuff them with — beans, beans and rice, beans and beef, just beef, chicken, carne adovada, or calabacitas. 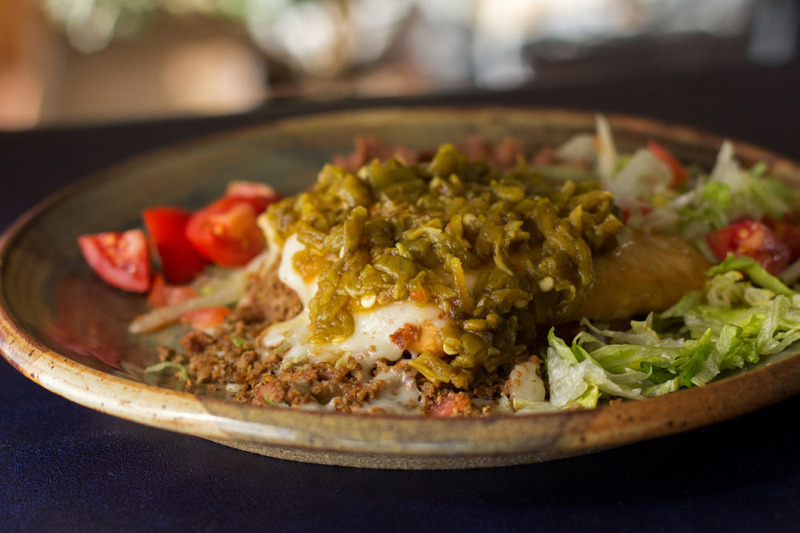 Once stuffed, the sopapilla is smothered in cheese and your choice of red or green chile, or “Christmas” (a little bit of both red and green). A recipe for sopapillas follows. In many New Mexican restaurants, dessert is complimentary. With each order you get one to two sopapillas. On the table is also a pitcher of honey. When you finish your meal, tear the corner off a hot sopapilla, wipe up that last bit of chile on your plate, and eat it. Drizzle some honey into the center of the sopapilla, ceremoniously roll the honey around to coat the inside, then take a bite of steamy, sweet goodness.